So I mentioned last week that I didn’t post this because I felt I was being too impatient. Impatient I may be, but it is what it is. I remain impatient. And so. My friends back in D.C. experienced ‘peak bloom’ recently, a term referring to the maximum beauty of the cherry blossoms that blanket the district each spring and provide an incredible backdrop to monument, festival, and school alike. Here in Seoul, as best as I can determine, we did not. Certainly, I will readily admit how very little of Seoul I have seen and so I will not say the city only has flowers in flower shops, but it’s not been great on the flower front thus far. At home, even if we have a late spring we’d have daffodils up early, with whichever other flowers following on their heels. I don’t know, I’m confident that I’m just looking in the wrong places (when I manage to actually get out and look). But still. I’m not used to having to look. Also, Seoul’s cherry blossom season is supposed to be next week or the week after, so things should be looking up. But there are flowers other than cherry blossoms. 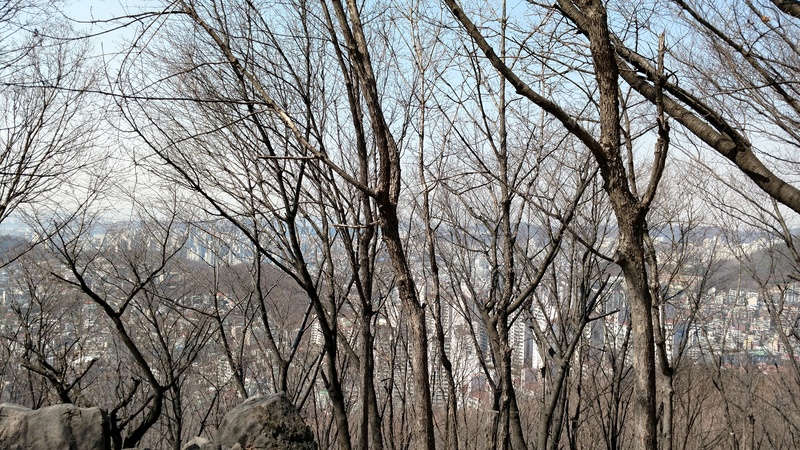 I’ve alluded to this fact before, but Seoul is a city of over ten million. 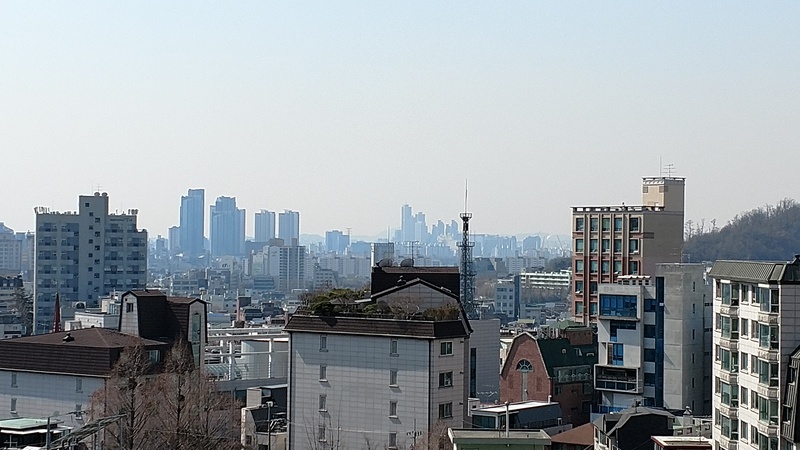 The greater Seoul metropolitan area is home to approximately 25 million people (yes, that’s half the country and the fourth largest metropolitan area in the world). There is some nature here, but it’s urban nature even beyond the likes of Phoenix Park or Rock Creek Park. And definitely not in the same league as Penrose Point or Sunset Beach. I’ve never harbored any doubts about not being a city person but if I had they would be put to permanent rest. Don’t get me wrong, there’s plenty to like. And this is 100% not an invective against Korea generally, rather cities generally. Dublin and D.C. managed to be okay because they’re neither one very city-feeling. Seoul is extremely so, even in relatively sleepy Seodaemun. Like I said, there are some truly beautiful things around here. Very picturesque mountains and trees that very much put me in mind of those classic East Asian watercolors with ruggedly steep and rocky mountains draped in leggy evergreens and silky streams. I’d post some pictures, but the haze doesn’t allow my minimal photography skills to do them anything like justice. Part of me is still just adjusting to the idea that I’m going to be living here for a year. As the times comes to put away my winter clothes, I have to keep reminding myself that I’m not actually done with them here, just waiting until winter comes again. And it’s weird. I have not spent this much time consecutively in one place since I got on a plane to D.C. on 16 August, 2012. (I’m like 92% certain it was the 16th. Maybe the 17th). When I was in Ireland it was close, I was there for pretty much exactly one calendar year, but I had almost an entire month home for Christmas which meant I had to pack things up and get settled then pack up and leave again. There will be no such break this year. I may spend a few weekends away, but that’s it. As it is, I am adjusting. And that’s what counts. On Sunday, I spent some time reading in the sun up on the roof. Expectedly, it was not perfect, but it was good. I will return there often, I hope, and perhaps find a few other good reading spots for the heat of the coming summer. Ups and downs or, as we talk about in class often, pros and cons. Benefits and negative effects. Good things and bad things. As in life, so in Seoul. In the meantime, take a look at the cats. Or cat and demon spawn, it’s hard to tell. You may recall back when I first arrived in Ireland a phrase that I used to cheer myself up about a less-than-ideal circumstance. Things here aren’t so bad, but the little plants I bought this week will not fill my flower quota. So I will repeat it now as a mantra for new places which, even having been here for a month now, this still is. I was going to write about flowers this week, but I think my frustration is mostly due to impatience so I’ll withhold final opinions for a bit longer to try and be fair. Patience is a virtue, yeah? Instead, I’d like to talk about some random things that have had me thinking this week. Yesterday, I finally watched the Swedish film adaptation of A Man Called Ove. It was really good, I thoroughly enjoyed it and would definitely recommend (after reading the book, duh). The book obviously had way more detail, so many more stories, so much more life and emotion. But the movie was in no way a disappointment. Also, did you know that only two presidents have been born west of Stonewall, Texas–a small town just west of Austin? Nixon was born in California and Obama was born in Hawai’i. Wikipedia lists California as the primarily affiliated state for two others, but still. As a West Coast individual through and through, I’m not sure whether to feel relieved or upset by this. It’s not really a surprise, I sort of know in the background of my mind, but I jsut thought that was kind of a lot, considering California has been the msot populous state since the sixties, and was in second place from the forties, overtaking Pennsylvania. And, as of the 2010 census, California had in excess of 12 million more people than the next largest state, Texas. I mean, being president isn’t and shouldn’t be directly related to population, but seeing as the West Coast is the Best Coast, I feel like we’re generally just better. But whatever, that was my random rant for today. I’ve finally gotten my Alien Registration Card, so I think I’m done with all immigration things for the duration. I hope. But also, it wasn’t hard at all, I literally just showed up, gave them the sheet that said I’d applied, and they handed me the card. In and out in like fifteen minutes, wait time included. So that was nice. And, once I had that, I could get my bank card. So I’m pretty much all in here. I also bought trash bags for the first time last weekend, it wasn’t really a difficulty but it was more difficult that I wanted it to be. I did have lunch with a friend and her mother this week. The friend is Korean and my family had hosted her as an exchange student a few years ago and now she’s going to college in Washington. She was visiting for spring break and it worked out that we were able to meet and I’m so glad. We had a lovely lunch of…something chicken and noodley that was served with an entire squid on top. The squid was fine, but nothing great. It was better than I expected of strange seafood (as I already don’t like seafood much) so I can say that I can handle it if needed in the future but I’m not ever going to seek it out deliberately. Anyway. I wish I had some goings on to share. I still haven’t been to any of the palaces. I haven’t participated in any protests. I haven’t done much of anything. I’m getting through my book, which is good, and I’m reading various Wikipedia articles as per usual. I’ve settled fairly rapidly into my standard do nothing, ever sort of routine. Teaching continues to get more normal every day, though I will no longer say it is getting easier. It got easier for the first while, now it just feels a bit better as I get used to it. But it’s still hard. I love a pun as much as the next guy, but even I must admit that this one is rather egregious. I can only claim innocence insofar as my sister made me do it. Like I said, puns are great, but living in the city of soul, one can only take so much. So I’ll try to make this the first and last. No promises. 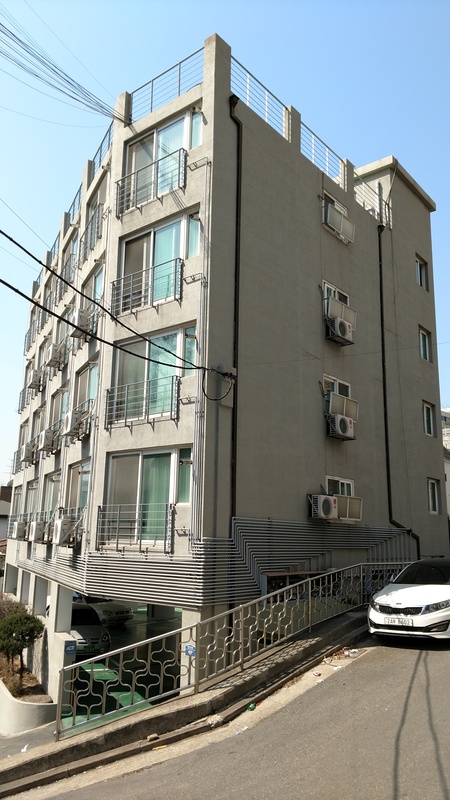 You may have heard a bit about happenings here in Korea on the news this past week. So the president was impeached a while ago and the ruling was just upheld by the highest court. So she’s definitely out. There were some clashes, but nothing absolutely crazy. The main thing is that it adds uncertainty to some things that are happening right now, like the US missile system and various goings on in the North. Nothing to be worried about, this is sort of just how the world feels when you pay attention to world events. Also, yesterday was the 100th anniversary of the end of the Russian Empire, marked by the abdication of Nicholas II. Just as there was a lot of important Irish history last year, there’s a lot of important Russian history this year. Wow, guys. It’s mid-March. I feel like it’s crept up on me all of a sudden. Also, I want to apologize, the title is at best a punny misnomer for this week as I haven’t really done much searching. I did finally bring myself to do a teensy bit of exploring yesterday in that I climbed the hill-mountain directly behind my apartment. It may or may not have involved approximately eight million stairs in addition to the trail-y parts. I’ll also give you a peek at my building and the view from its extremely low roof (only five stories!). So I’ve been promising more details on life, today I’ll address license plates because why not. First of all, not as soothing as Irish plates. There seem to be three kinds (aside from US military plates, which I see occasionally): yellow, green, and white. Green are an absolute mystery, they come in different shapes, on different cars, and I kind of hate them. The yellow I believe is for passenger vehicles, so taxis and buses. They sometimes look a little different but they are basically similar and I’m pretty sure I recognize their purpose. White are most common and I appreciate them the most. They are clear, simple, and use just one syllable block combined with numbers. I can’t say if there’s any rhyme or reason to them, but they’re at least straightforward. I don’t think anyone could really outdo Ireland in terms of lovely ways to number cars. But I’m definitely not complaining. Korean experience of the week: jk. This past weekend I attempted to cook something fun for myself and it turned out much better than expected. Now I know that I’ve posted here before about my baking experiments with my friends, and I do really love doing that. But cooking on my own is not something that I enjoy at all. I mostly do it because I know I need to eat and it’s cheaper than eating out (and healthier, usually). And since I’m really and truly living on my own for the first time, and I have a whole year ahead of me, I figured I ought to branch out a little. They were good not great, but I am impressed with myself for a first attempt. I didn’t even have a rolling pin. Will definitely be making again. Anyway, that’s about all I have for you this week. Spring is approaching here (I hope) and I think things are generally on the up-and-up. Maybe not coming up roses (and more next week about the dearth of daffodils) but good enough. And that’s all I ask for. I will not apologize for the amount of poetry-related content on this blog. Just wanted to put that out there. But more on that later. 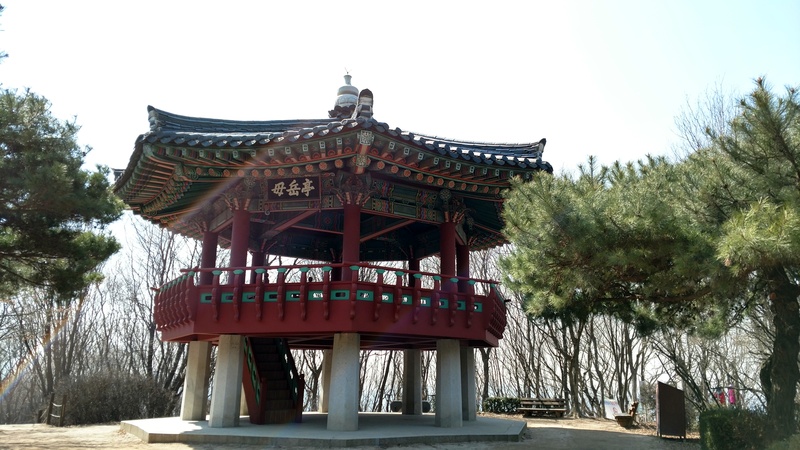 I promised a glimpse into my life in Seoul so here are a few things. So those are a few things that have helped make the transition easier. I regret (so very deeply) that the cracker situation is pretty hopeless. As great as Paris Baguette is, it simply cannot compare to those Tesco doughnuts and I don’t even want to talk about crackers. Alas, you can’t win ’em all. There are crackers here, but I think once you go Tesco Cream Crackers, you just can’t go back. I’ve also now found out what I’ll be doing on Wednesdays. I will spend three hours calling students one-on-one to have ten minute conversations with them. They’re mostly not my students in class, we just talk. The headset is very uncomfortable, but otherwise it’s not bad. Occasionally I will also do intensive study sessions or review groups with small numbers of students. But mostly it’s the phone classes, at least for now. In terms of Korean experiences for the week, I haven’t had many. Other than getting a bank account and having barbecue, I’ve pretty much stayed home. As you know, that is my default setting. And I won’t be rebuked for it. I know I said that I want more out of this year than just work experience, but that doesn’t mean that I have to spend all of my time eating Korean food, wandering around, seeing what can be seen. I have time, I have eaten food, and nothing’s wrong with me cooking for myself. I want to see what I can see, but I also want to be me and me is a person who stays home nine times out of ten. I came to Korea, that’s plenty for the moment. Also, first post-departure contact with a certain very pretty kitty. The other was indisposed by illness, unfortunately. He’s on track to recover though. So about the poetry that I mentioned earlier. Here’s the thing: because I have so much of it in my head, much like music it can suddenly pop in and get stuck like a song, but just a couple lines of text. This one has come to me occasionally for years and I really like it. This, of course, is from Oliver Wendell Holmes’ wonderful work The Chambered Nautilus. In it, Holmes describes the way in which the nautilus is always moving onward and upward, building itself larger and more lovely shell space until at last it is freed from the mortal (and nacre) coil. I don’t even have anything in particular I wanted to say, that poem has just really been sticking with me this week. It really is a lovely poem; it is a song of freedom and release. To close yourself with a dome more vast until you finally expand beyond all confines. Ugh, I don’t even know what I’m saying, but read the poem, I really like it. More stately mansions indeed. Till thou at length art free. First, a quick overview of how the Korean language works (written Korean, that is) because you know I like language. The most basic misconception is that it’s like Chinese, written in characters. In fact, Korean has an alphabet with letters. The difference is that those letters are combined into one-syllable blocks. So while ‘s’ is just ㅅ and ‘u’ is ㅜ, the syllable su wouldn’t be written ㅅ ㅜ but rather 수. My name, written in Hangul (the name of the alphabet) is 키간. 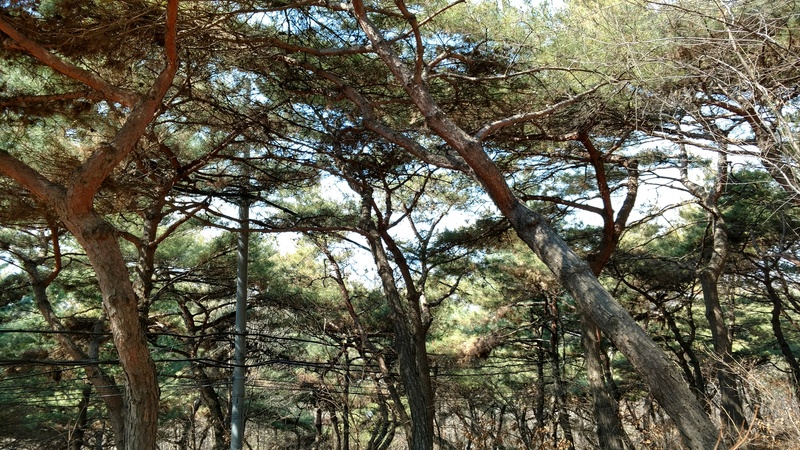 The title of this post is Seodaemun-gu, the district in which I’m now living. So on Friday, we had our final assessments in the morning which, thankfully, I passed. Then I got in a van that drove me across the city to my branch (I feel bad for people who actually were leaving Seoul, a 45 minute journey was all I was up for). I stayed in a little hotel across the street from the branch while my apartment was being prepared. There was a little bit of confusion about the apartment which meant that I didn’t actually move in until Monday night, after teaching, but I’m here now and it’s grand. On that note, a bit about my actual job. So. Firstly, I teach English to Korean students after school. Two three-hour classes a day, 4-10 and arriving at 2 to make it a normal eight hour work day. That’s the basic set up. The way my company works is that it divides students into levels based on skill (pretty straightforward) and then has different courses that students can take. Usually, students take two concurrently, so I’ll mostly have the same four classes twice a week but have different material. One course I’m teaching is sort of content-heavy where we do readings and listenings and stuff. The other is more discussion-based with a project every other week. The ages of my students range from maybe 8 or 9ish to I think 14ish, with levels ranging from barely conversational to reasonably okay. Teaching is hard. This is not news to me, having grown up with educators and with tremendous respect for the profession, but actually being a teacher is a different experience. Some classes, some students, some lessons are better than others and I will obviously continue to learn a lot over the course of my time here. One week of whirlwind training is hardly acceptable for such an important job, but it’s better than many other English companies here provide. Anyway, I’m managing alright thus far and hopefully will continue to learn techniques and methodologies, acquire fun new skills, and develop the general everything necessary for teaching. I know that there is a large number of teachers and educators who read this blog. If you feel so inclined, know that I would welcome any advice you have to offer, perhaps by Facebook message or email. Of particular interest to me at the moment are like vocabulary games I could play and ways to get silent classes talking. There are a million other things that I want to talk about in this post, but a million is a lot and probs no one would read a blog a million things long. I have a year here (excepting unforeseeables) and that is plenty of time, I hope, to tell you all about it. It’s not a million posts long, but I’ll do my best. I was going to talk about triangular kimbap and Paris Baguette and Seodaemun and my apartment. I was going to tell you some of the things that have caused minor freak outs and other things that have provided unexpected comfort. Alas. You’ll have to rest assured that there are such things and hope I include them in future posts. Living in suspense of every detail of my life as I’m sure you do, this may be difficult but I ask that you bear with me. Also, small Korean experience of the week. You may be familiar with cat cafés (which I have not yet visited, shame) but apparently there are many different kinds of interesting cafés here. For example, I briefly visited a sheep café (the sheep were in a little pen that you could go into) which was across the street from a raccoon café (which people tell me also has a few small dogs). So I guess there are cafés for a range of tastes. I’ll look forward to checking them out, I guess, though I’m not convinced the cat ones are as magical in reality as they may seem at first blush. Anyway, that’s all I have for this week. I’m still adjusting to my new get-off-work-at-10pm schedule but if I could adjust to start-work-at-3:30am, I think I’ll be fine. Happy March.